College of Engineering in the University of Information Technology and Communications held a Symposium on Electronic Currencies. The College of Engineering at UOITC held a seminar about electronic currencies and their impact on the economic situation of the country. The Assist. Prof. Dr. Ahmed Abdulsahib, Head of Media Technology Engineering Department at the college of Engineering presented the seminar and started with a historical background on cash exchanging until reaching to the most important electronic currencies traded in the countries of the world, whereas the digital currency was widely recognized in the second half of the previous year 2017, and the demand increased by nine times even though it is not under a central bank or monetary authority. The seminar explained, that these currencies surpassed the value of the digital currencies market by 270 billion dollar and the new digital currencies has been announced to the market. Economists believe that the market value of 270 billion dollar is only the first step toward the market value of 1 trillion dollar. A good strategy for achieving this growth is to invest in the largest digital currencies that their value exceeds trillions of dollars as a weighted average in the market. Different types of currencies were mentioned in this symposium such as the BTC, BCH, ETH, ETC, DASH, LTC, RIB, etc. These currencies vary in terms of their monetary value according to market exchange. The main features and the differences of these currencies were discussed in the symposium like updating the rules of the agreement, which will allow the encrypted currency to grow up and expand and also is considered one of these differences, which allows to reduce the spent time in transactions of electronic currency, and what distinguishes others that the Block Chain is not directed to be a payment system as a BTC but as decentralized solutions that enable applications to operate automatically without a server, as well as will allow secure exchanging. 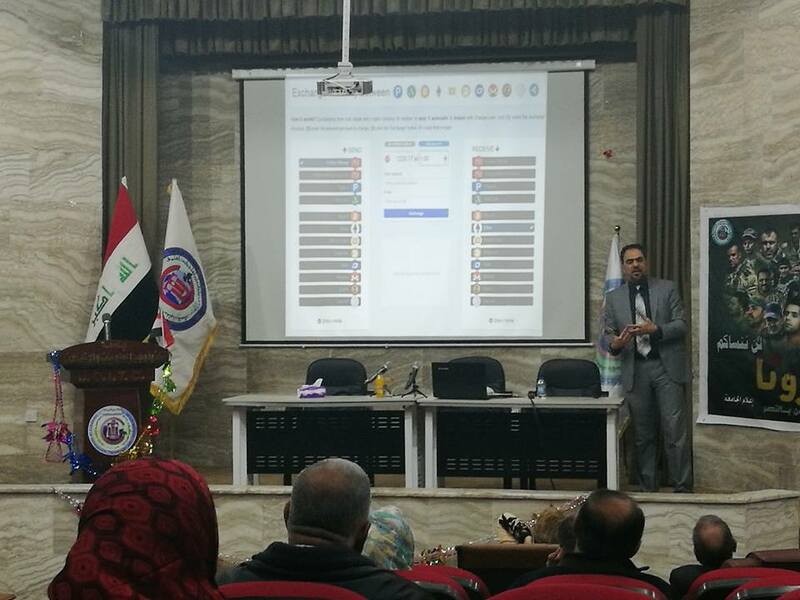 The symposium concluded that the Central Bank of Iraq is responsible for releasing of monetary categories in the country but it did not support or agree with dealing by these electronic currencies depending on its conviction in the lack of need or in the security issues or other aspects, but we find that are used in exchanging in many of the developed world.